- SECW Inaugural Brawl (January 31, '10) = JT Flash defeated J Dawg Brooks. Later on, Flash won the first-ever SECW South Florida Championship, winning an "Over The Top Rope Battle Royal". - SECW Fair Invasion - Night 3 (February 12, '10) = Flash retained the SECW South Florida Title, beating Maxx Stardom. - SECW The Strong Will Survive (February 21, '10) = Flash, as the SECW South Florida Champion, fought to a draw with Mikhail Ivanov. - SECW Tag-Team Mayhem (February 28, '10) = Flash kept the SECW South Florida Title, beating Chasyn Rance. - SECW Aggression '10 (April 3) = Flash stayed the SECW South Florida Champ, via reverse decision DQ, over Dave Logan. 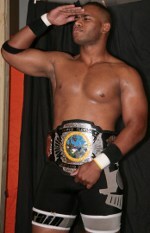 - SECW May Day '10 (May 22) = Flash retained the SECW South Florida Title, defeating Torcher.